A broadly columnar Red Maple that was introduced to the trade by the U.S. National Arboretum in 1994. The fall color begins as red, turning to purple-red as the season progresses. This is a male selection, good for street tree use. 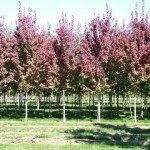 It is a hybrid of 'October Glory' and 'Autumn Flame', and fall color peaks between the two parents. Prefers full sun and slightly moist, acidic soils.